A warning before you hit the beach this weekend: The Troubleshooters uncover which area beaches are closed most often and why. Find out what's in the water before you or your family jump in! You may not think going for a dip at a beach or lake can make you sick. Geetha Smith said it happened to her. "t was bad, you know, you had the vomiting, the diarrhea," she explained. 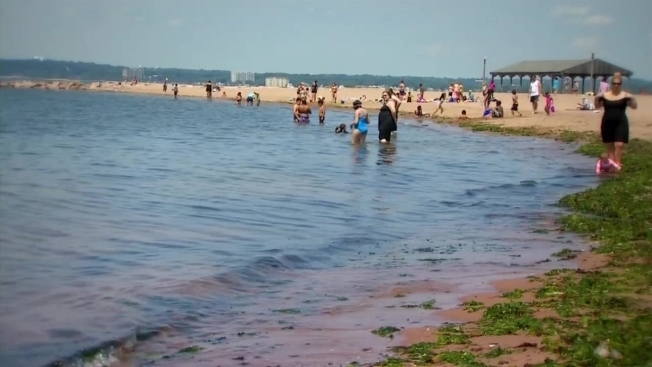 That's why state and local agencies conduct weekly water monitoring at 92 of Connecticut's public beaches Memorial Day through Labor Day. Inspectors with the state Department of Energy and Environmental Protection monitor four shoreline beaches and 19 lake beaches. "On Mondays and Tuesdays, we go out and test the beaches," said environmental analyst Tracy Lizotte. This includes the beach at Lake Waramaug in Kent, which inspectors closed for high bacteria the day we visited. The federal government collects data on the 73 public beaches on Connecticut's shoreline. We examined the past three years to see which have the highest totals of days off-limits due to closings and advisories. Take, for example, the beach at Lighthouse Point Park in New Haven. Federal data indicates it was closed a dozen times in 2012, twice in 2013, and four times last year for elevated bacteria levels. That puts the Lighthouse Point Park Beach in the top 10 for total days closed the past three years in Connecticut. It may be one reason some beachgoers like Smith take precautions. "I told my children, 'Do not swallow that water, because I don’t know what's in it,'" she explained. The federal data shows health inspectors closed the Lighthouse Point Park beach mostly for elevated levels of bacteria. "That's gross," said Renee Colangelo, of New Haven. "Wow." The source of that contamination: most often something called a combined sewer overflow, which happens during a heavy rainfall. "The sewage treatment plant, they can't handle the capacity of water coming at them and they have to let the water out a little less-treated than if it was a regular day," Lizotte explained. She added that local and state inspectors will also close a beach or issue an advisory as a precaution before a big storm. Too much rain can lead to runoff that waterways and wetlands leading to the beaches cannot fully filter out. "My recommendation typically is not to swim 24 hours after a rain event. Those are when we really see our higher numbers," Lizotte said. Sometimes Mother Nature herself causes beach contamination when wildlife waste fouls the water. Discharges from boats large and small can also cause problems. "Probably should be testing it daily, especially in the summertime," Colangelo said. Federal data shows other beaches with significant numbers of days closed include Rocky Neck State Park beach in East Lyme, plus a half dozen Fairfield County beaches. See which beaches were closed and for how many days from 2012 to 2014. Click here for real-time information on beach closures.